Bike theft is a growing issue in South Africa, one that can often be prevented by being prepared. Follow our guide on how lock your bike properly, home storage, security and what to do if your bike is stolen. A hardened-steel U-Lock is the most secure kind of lock and should be used as your primary lock. Cable locks and cheap U-Locks can be easily cut and are best avoided. U-locks can be carried in backpacks or panniers. Some locks can be mounted to your bike frame. The smaller the U-lock the better, it’s lighter to carry and the small size makes it hard to pry open with a crowbar. Avoid locks with a combination. It is best to lock your bike in a highly visible area close to pedestrian traffic and streetlights. Look for designated bike racks or indoor parking areas. Don’t lock your bike in the same location all the time and never leave it outside overnight. When leaving your bike for an extended period of time, either choose a location that is busy e.g. outside a cafe where it appears you’ll be returning any minute or secure your bike inside your place of work – out of sight from potential thieves. When possible secure your bike among others. There is sure to be an easier target for the thieves close by and it’s harder for them to work their tools. If you lock your bike to a street pole or sign post, make sure that your bike can’t be lifted over it or that the whole thing itself can’t be stolen or taken apart. Keep your bike safe from cars by positioning it parallel to the edge of the pavement, but away from the street, on the building-side of the signpost. Avoid blocking pedestrians movement. Secure your frame to an immovable, fixed object. A cable can then be used to secure your wheels either to the frame or the object. Two security devices equal more protection and more time for a thief to have to work! Remove your front wheel and place it by your rear wheel. Place u-lock shackle around the immovable, fixed object and through one or both seat or chain stays (if frame will allow) and the two wheels. Lock through the rear wheel (within the rear triangle of the frame) and secure to a fixed object. When locked this way, it’s impossible to pull the wheel through the rear triangle and effectively locks the frame! Always lock your bike up, even when storing it at home or when transporting it – it is amazing how many bikes get stolen from seemingly “secure” locations. If you live in an apartment, or don’t have much room, look at installing a wall mounted bike rack, like the LEA Bike rack. This compact storage solution can be easily mounted to any vertical surface and allows for the bike to be locked securely to it. Crime is an unfortunate reality in South Africa, and muggings and bike-jacking do occur. Stay safe by cycling in groups. Cycling together not only reduces the risk crime, but makes it easier for motorists to see you on the road. Avoid cycling in isolated areas or know crime hot-spots rather stick to well used and recommended routes. Register and tag your bike. 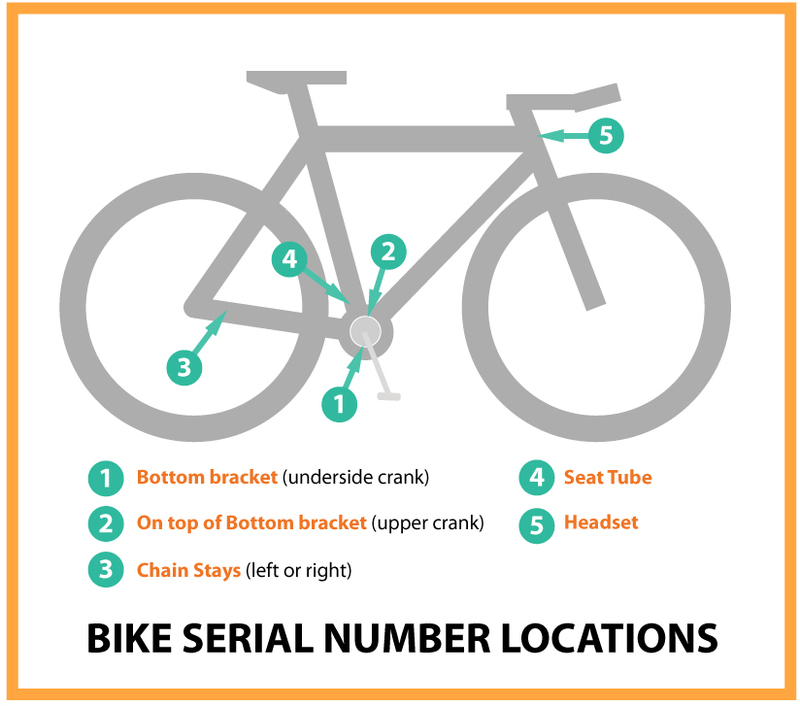 Record the serial number of your bike, found at various locations on the frame (see diagram of serial numbers). These numbers can be used to identify your bike if stolen and recovered. Use the Bike Hub‘s Stolen Bike database or the Bicycle Registry of SA to register your bike and report theft. When the worst happens it is easy to despair. While the majority of bikes that are stolen are never recovered, you may be one of the lucky ones who finds their bike again. By following the steps, you have a greater chance of reclaiming your bike. File a report with the SAPS (South African Police Services). Provide serial number and pictures of your bike if you have them. Register and report your stolen bike on the Bike Hub’s Stolen Bike database or the Bicycle Registry of SA. If you receive a tip or info, contact the police. Do not attempt to recover bike on your own. Tweet a photo and description of your bike to local cycling groups and businesses social media profiles. Include info about where it was stolen and any other details of the theft. Look for cameras where your bike was stolen. Sometimes buildings have cameras facing the street. Contact the building owner to recover tapes.Perhaps there were even witnesses to the theft. Visit local pawn or swop shops or bike shops. Look on Gumtree and online stores and tell your friends to look out for your bike around the city. Ask local bike shops to look out for bike. If you do spot your bike, call the local police immediately and ask them to assist in your recovery. Always remember when buying a second-hand bike, to check that the seller owns it. If you buy stolen goods not only is it illegal, it also builds a market in which thieves can operate. If your bike is truly gone, then file a claim with your insurance company.